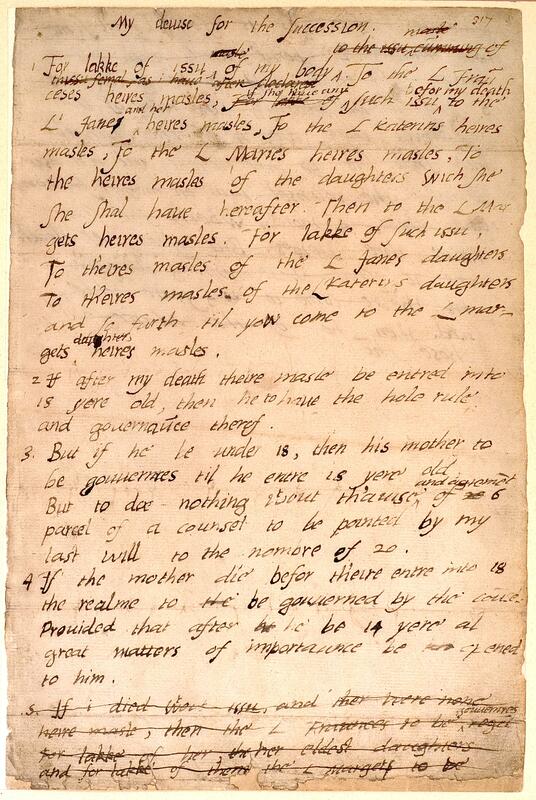 The King’s speech, as rendered in 1554 by the Suffolk gentleman and Marian eulogist Robert Wingfield, is thought to be reasonably accurate, for Wingfield almost certainly had it from one of the judges present.11 Still, some elements of the unabridged text may be the writer’s embellishments, like some extreme abuse of Anne Boleyn and the clearly tongue-in-cheek praise of Guildford Dudley – ‟a man, unless I am mistaken, born to achieve celebrity; from him you may expect great things, if it please the gods“. Whatever the case, the official letters patent – which resulted from this meeting with the lawyers and still contained many of the more bizarre elements of Edward’s original ‟Devise“ – referred back to Henry VIII’s annulled marriages in sober legalese, even discussing his 1544 Succession Act. They also advised a further danger connected with Edward’s sisters, namely that they should marry a foreign prince, ‟which would then tend to the utter subversion of the common-wealth of this our realm, which God defend.“12 In view of Mary’s absolute reliance on the Emperor and the Habsburgs’ notoriously successful politics of marriage this was an obvious point (one originally brought up by the King in his speech to the lawyers13 – and unsurprisingly omitted by Wingfield). 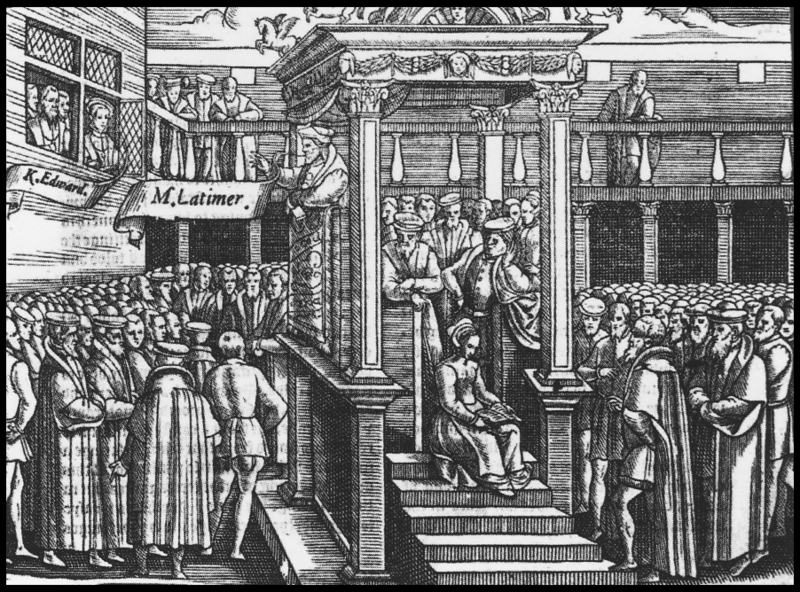 Edward VI, on the right side at the window on the left, listens to a sermon by Hugh Latimer in 1549. Woodcut from Foxe’s Book of Martyrs, 1563. First, that during the young years of any my heir or successor, my executors shall not agree to enter into any wars, except upon occasion of invasion to be made by enemies: nor, to the best of their powers, shall suffer any quarell to be unjustly piked by our subjects whereof any war may ensue. Fiftly, my will is, that my sisters Mary and Elizabeth shall follow the advice of my executors … in their marriages, and if they so do, and will be bound to live in quiet order, according to our appointment, and as by our said executors shall be appointed, we will, that they, and either of them, shall have of our gift one thousand pounds yearly, by way of annuity out of our coffers. And if they do marry … then we will that either of them shall have towards their marriages, of our gift, ten thousand pounds, over and above the money for their marriages given by our father’s bequest. From this it clearly appears that Edward expected his sisters to abide by his provisions, in the interests of the country’s peace. Indeed it has been suggested by J. L. McIntosh that the grant of Framlingham Castle to Mary and another transaction to the benefit of Elizabeth were the material basis of a tacit agreement between the sisters and the government to accept and honour their brother’s ideas for the succession.34 The notion of such a deal is certainly strengthened by the King’s expectations that his sisters would ‟live in quiet order“. All our debts to be paid with as much speed as may be. To be bestowed in highways, and to the poor, by discretion of our executors, the sum of [blank]. The Chronicle of Queen Jane. (ed. J. G. Nichols, 1850). Camden Society. Literary Remains of King Edward the Sixth. (ed. G. J. Nichols, 1857). Roxburghe Club. The Diary of Henry Machyn. (ed. G. J. Nichols, 1848). Camden Society. Alford, Stephen (2002): Kingship and Politics in the Reign of Edward VI. Cambridge University Press. Jordan, W. K. (1970): Edward VI: The Threshold of Power. The Dominance of the Duke of Northumberland. George Allen & Unwin. Kantorowicz, E. H. (1981): The King’s Two Bodies: A Study in Medieval Political Thought. Princeston University Press. Loades, David (2004a): ‟Dudley, John, duke of Northumberland (1504–1553)“. Oxford Dictionary of National Biography. Oxford University Press. Loades, David (2004b): Intrigue and Treason: The Tudor Court, 1547–1558. Pearson/Longman. MacCulloch, Diarmaid (ed.) (1984): ‟The Vita Mariae Angliae Reginae of Robert Wingfield of Brantham“. Camden Miscellany. Volume XXVIII. Royal Historical Society. MacCulloch, Diarmaid (2001): The Boy King: Edward VI and the Protestant Reformation. Palgrave. Skidmore, Chris (2007): Edward VI: The Lost King of England. Weidenfeld & Nicolson. This entry was posted in 1553, Edward VI, John Dudley, sources & historians and tagged Henry Sidney, John Cheke, Lady Jane Grey, Margaret Clifford, Mary I, minority. Bookmark the permalink.